THE OTHER bats in the big bag might as well have been steel hammers of Thor, the Norse god of thunder. For the little kid, the one seemingly dwarfed by the bag and its wealth of 34-inch bats, there was no fear in the presence of mighty swingers. He just toted along his little aluminum toothpick of a bat and his tiny little baseball glove. It was time for Mommy to hit Danny Boy some grounders. Under the lights of fields near and far, little Danny the toddler tagged along with Daniel Sr. and Leslie, two softball fanatics in love with each other, their little boy and the game itself. Long before each game, there he was, eager and smiling, spearing each little grounder, eyes bulging on the bad hops. Leslie had a trained, efficient swing, measuring Danny Boy's raw talent and desire to please Mommy with each tap of the ball. The tiny tot learned well. Very well. MORE THAN a decade has passed since Daniel Higa Jr. began playing organized baseball, honing his craft informally with Mommy and Daddy. Today, he stands in at the plate, a proud Crusader, already hitting higher than .400 in the always-tough Interscholastic League of Honolulu. The season has been a test in many ways. Saint Louis scores runs and surrenders runs, not surprising for a program in rebuilding mode. After a loss to Damien, the Crusaders are 1-6. The promise of nonconference play, when they went 10-2, is nearly forgotten by coach Duane Fraticelli's young squad. Danny Boy, who has a 2.8 grade-point average, dreams of playing college ball. Right now, though, the starting second baseman can't stop thinking about his team. Losing the will to fight on is not an option. "It's just like some people think they're quitting already, they don't want to be there because of our record. They're not working as a team," Higa said, not in remorse or anger, but with absolute calm. "We just gotta pick it up, start off good now and take it to the playoffs. We have the talent. If we execute we can get there." Every morning, Leslie is there, and each night, she awaits his return. Danny Boy didn't ask for much when Leslie departed in body, but he needed to know that her spirit would be near. So, not long after she died in 2000, Danny Boy got his wish. The urn that keeps her ashes is right there in his room, not that he ever really needs a reminder of her love. THE ORIGINAL Danny Boy was Daniel Sr., who was working at the Boys and Girls Club of Honolulu when he first met Leslie, a bundle of energy who didn't like sports. She loved sports. When they married, Daniel Sr. took in Leslie's two children, Mark and Rayline. Danny Jr. came along in 1990, and his first memories were of the softball diamond. Dad pitching. Mom playing every other position. Life was just about perfect, which is usually when the rug gets pulled out from under. Two years after being diagnosed with breast cancer, Leslie was beginning to lose the battle. 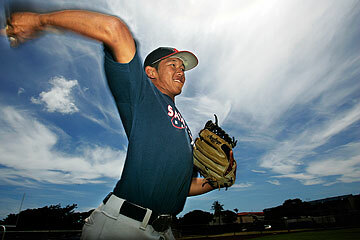 Danny Boy was a third-grader at Lunalilo Elementary when Dad explained things. "He said Mom was sick, she had cancer," he recalled. "They had to remove one of her breasts, and she wore a hat all the time. A woven hat." Danny Boy wasn't intimidated by the unknown, nor the confines of a hospital. "I got to see her almost every day. We used to visit her. Sometimes, she came home," he said. He played sports year-round, but baseball was king. "She came to all my games. If I knew she couldn't come, I would think about her during the games. She said, 'Don't worry about it.' I used to ask, 'Are you gonna come out soon? Is everything all right?' "
His life has been a series of fourth-year revelations. From birth, then to the fields and Mommy's grounders at 4, then to life-and-death questions at 8. Leslie soothed Danny Boy the best she could. "She used to say she'd be all right. She fought it pretty long," Danny said. Two years later, her time had come. Leslie was ready to say goodbye to her two Dannys. They went to see her again, at Queen's Medical Center. "My dad said it was time for her to go. I went in. I came right back out," Danny said. "I couldn't cry." There would be no more Mother's Day cards, thanking Mom for teaching him how to hit a home run. "You wake up," Danny said, "and you think your mom's gonna be there, but ... "
At 44, Leslie Higa was made for heaven. DANIEL SR. made good on his promise to Leslie to live life to the fullest. Over the next few years, his family grew closer together. When he sat Danny down for a heart to heart about the future, there was no surprise. The family was about to expand, and at 12, Danny was getting a new family. In the four years since his dad remarried, Danny has learned to adjust. Already more than a decade younger than his older siblings, he now has a 2-year-old sister (Shea) and a 9-month-old brother (Brennan). To nobody's surprise, Danny loves playing with the babies. Just don't ask him to do the dirty work. "His time will come," Daniel Sr. said. Danny never missed a beat when it came to baseball. His new mom, Lindy, drives him to the batting cages in the offseason. Uncle Lenn Uyeda hits ground balls, and his Lenn's wife, Aimee, shags Danny's batting-practice hits. In fact, his new grandpa, Leroy Uyeda, is a former Roosevelt coach. He couldn't get away from the game even if he wanted to. He also can't get away from the one rock in his life. "As old as he is," Daniel Sr. said, "I still tell him, every night before he goes to sleep, 'I love you.' "
Watching his immaculate execution fielding ground balls, someone familiar smiles. "I know she's still watching over me," he said. The young man has learned well. Very well.